I just invested $17.95 in 250 grams of bee pollen from the latest health food store to hit Fitzroy, and now you get to live vicariously through my Instagram feed. 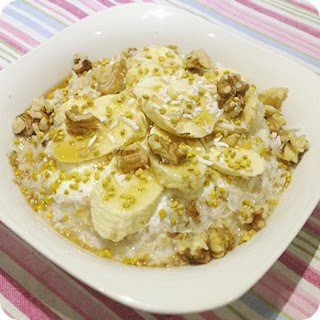 By the time I pimp my porridge with the nutty yellow granules (let’s not forget the chia seeds), fan my banana, decide #nofilter is necessary, upload the image and quip “oatsess with the mostest”, my breakfast will be stone-bloody-cold. Seduced by a ‘superfood’, I immortalised my conformism on Instagram. The world is not a better place because of it, or perhaps 41 ‘likes’ and nine comments beg to differ. Every notification that springs up on my iPhone is a narcissistic pat on the back. “Well done,” they seem to say, “your meal times are superior”. But these notifications are mostly from other bloggers. It’s an ‘I show you mine, you show me yours’ situation. On most nights my feed is clogged with the exact same photos taken from different angles, courtesy of restaurants’ public relations companies inviting a bevy of bloggers to exclusive dinners and events. The perks are there, but often the substance isn’t. It’s difficult not to drown in the wave of social media sameness. Unique selling points are often limited to a food blogger’s size of audience rather than quality of content. Blurred photographs and grammatical gaffes pollute the Internet. Ill-informed opinions and uneducated guesses are plastered on every digital wall of the web. I try to keep my head above water, but the undertow constantly pulls at your feet. Integrity is everything. My iPhone, switched to silent, vibrates from another room. My ears have evolved to hear it. Often I imagine the all-consuming buzz. It’s another virtual pat on the back, this time from a girlfriend suggesting we “grab an early vino”. I decline; Friday nights are for family, specifically my grandparents. I’m not exactly a good Jewish girl (shellfish is my kryptonite and a side of bacon with my smashed avocado is compulsory when brunching in Melbourne) but I adore the tradition of eating with those closest to me. Nothing makes me happier. Unexpectedly, I didn’t have dinner with my grandparents that night. I sat beside my beloved grandmother in a hospital bed, listening to my parents and grandfather talk about her in past tense two hours before she died. If she had woken up, we might have visited her favourite café, Sand Bar in St. Kilda, wrapped tightly in extra jumpers as a sacrifice for soaking up some vitamin D. I might have Instagrammed her sipping her not too hot, extra chocolaty hot chocolate, don’t you dare hold the marshmallows. My grandfather found comfort in a cup of instant miso soup and a few squares of dark chocolate, but he lost his appetite when he remembered – out loud – that my grandmother would never eat again. The hospital staff gave us space and knowing looks, and asked us if there was anything they could get for us. Although the nurse who opened the door to announce “meal time” a short time later was met with a typical, blunt retaliation from my grandpa: “she’s dead!” We laughed – how could you not? Outside, Mazzitelli on Bridge Road was filling up with couples and young professionals pretending to know something about Italian wine and charcuterie and sharing their ‘knowledge’ with their followers. My clammy hands clasped each other like the plastic barrel monkeys I used to play with, before my grandmother’s Parkinson’s put an end to crafting mermaid dolls from scraps of fabric, and cooking Friday night dinners that started with chicken soup and finished with babka cake. You’ve never tasted soup like my grandmother’s chicken soup. After years of referring to it as ‘Friday Night Soup’, my vegetarian aunt finally discovered what it really was and made a conscious decision not to deprive herself of it. The week following my grandma’s death, our kitchen was flooded with countless cakes and loaves of bread. Everyone who walked through our front door was armed with edibles and stories to tell, reminding us not of what we had lost, but of what we had gained by knowing someone so special. Old friends dropped in giant trays of homemade lasagne, Chinese takeaway, and eskies of curries and soups. We fell into a routine with all the visitors paying their respects: wake up, set the table for breakfast, serve breakfast, make coffee, clean up breakfast, set the table for lunch, serve lunch, make coffee, clean up lunch and repeat for dinner. It was cathartic, and the comfort we gained from eating and sharing memories together – those times waterskiing at Yarrawonga, my grandma’s obsession with leopard print, how she laughed at my grandpa when he asked her to marry him on the first date – was a precious part of the healing process. My narcissistic porridge felt like years ago. Life isn’t about food; food simply connects the dots. It denotes history and culture. It brings people together. It marks occasions, from birthday cake and roast turkey, to apple dipped in honey and sweet challah bread. But it’s not the flavour of the birthday cake that sticks in your mind; it’s the image of blowing out the candles. Photographs of these cherished milestones become victims of social media, getting lost in the noise of Twitter, the self-righteousness of Facebook and the ordinariness of Instagram. We are blessed to live in an age where it’s effortless to capture a memory, but once in a while, let’s focus on living instead of immortalising. Death so often comes with a side of perspective. Sorry to hear about your Nan. She sounds like a wonderful lady. Your insight belies your years and your words capture your thoughts exquisitely. Beautiful post fi. Sorry to hear about your Grandma.